I hope that everyone had a safe and happy Thanksgiving! Now that it's over, I'm wondering how all of you did with this food-filled holiday. I cooked for my relatives this year for the first time in a long time, so although I was hoppin' in the kitchen all day, I didn't have to face my usual worries about food cooked by others for my severely allergic child. In past years, I've had some cooperation (such as no pecan pie served) and some not-so-great moments, like a child who refused to eat the Thanksgiving dinner but instead insisted on a peanut butter granola bar at the "kids table" with my daughter. At Thanksgiving, just like at school, we need a peanut-free table for her so that was awkward, especially since it wasn't even my home. I've also been concerned about things like what type of bread is used in making stuffing, what's in the turkey gravy and of course, desserts. What about you? I had posted Thanksgiving tips--did any of you find that those strategies worked? What did you feel was your biggest problem with food allergies--if any--over Thanksgiving? And please feel free to share your success stories--we need those too! I'm open to your comments and questions. With more winter holidays coming up quickly, we're going to need all the nut allergy strategies we can get! Just in time for Thanksgiving--a sweet potato recipe that tastes great and is so easy to make. Plus, unlike so many of the sweet potato recipes floating around during the holidays, this one has no pecans, walnuts or marshmallows. I like my sweet potatoes "clean tasting" so this is perfect for me besides being safe for many food allergies. And you can make it in your microwave. What could be better? I adapted this recipe from the wonderful cookbook "How to Cook Everything" from food writer Mark Bittman. I'm hosting Thanksgiving tomorrow and I'm pretty much making everything from scratch, so let me take the time now (while I have it) to wish all of you a very happy, safe and joyful Thanksgiving! A Safe, Nut-Free Thanksgiving with the "Non-Cooks"
I realized after talking with a few friends about Thanksgiving that I'm surrounded by "cooks" in my own family and not used to attending family gatherings with the "non-cooks" of this world. It's difficult enough to try to make sure your child has a safe meal at a dinner party if the hosts are cooking the food. But what about people who choose to cater the entire meal? Obviously that's the best choice for some people, but a catered meal can be a nut allergy minefield. Treat a catered meal like a restaurant meal. You need to know everything that goes into the food and the environment in which the food is prepared--just like at a restaurant. It also means that you may end up discovering that the meal doesn't meet your standards for allergy safety. For example, the roast chickens on a spit that are sold at my local supermarket say that the chickens were processed in a facility with nuts, as well as several other food allergens. I'm guessing if your hosts go the supermarket catering route, the same goes for turkey. How do you find out what's safe? You need to ask your hosts where the food is coming from and then call the venue to find out how the food is prepared. Sometimes the food won't be safe for your family because of cross-contact concerns or ingredients you can't have. What other foods are being prepared in this kitchen? Are you able to accommodate food allergies? Do you have any procedures for separating foods? Are there any nut products in the turkey stuffing or side dishes? (Pecans are a popular addition to stuffing as well as sweet potatoes). Please be aware that simple foods like mashed potatoes--when prepared outside of a home kitchen--sometimes contain ingredients like peanut oil for smooth consistency. You must ask about everything. Personally, I'm not comfortable serving a catered meal to my daughter because there are just too many variables. And not everyone has the same level of food allergy awareness, so they may believe something is safe when it isn't. It's good to have a backup meal for your allergic child and it's always a great idea to bring a side dish or dessert that's safe for your family. That way, your child can participate in some of the foods on offer. It's hard to single your child out at a party as having to avoid foods, but it's very important to be cautious. Tree nuts turn up everywhere in Thanksgiving recipes. I always want everyone to be safe, even if it means skipping one or two dishes--or even the entire meal--in order for that to happen. Holidays are a time when it's tempting to let your guard down, but don't. You need to keep the same rules for food and eating that you usually do, now more than ever. How do some of you handle the catered meal challenge? Recently I was contacted by Ian's Natural Foods, a food manufacturer that specializes in organic, gluten-free and allergy-free foods. I received two sample packs of their Fruit-a-Bits crispy fruit snacks to try. In size and shape, they reminded me of the candy "Nerds" but they had a crispy, fruity flavor that wasn't overly sweet. My kids were each handed a bag when they got home from school and the snacks disappeared shortly thereafter. I take it that they liked them! In fact, my youngest daughter told me that "they're nice and fruity." The company suggested that they would make a good ice cream or yogurt topping as well and I could also see them as a good, nut-free choice for mixing up your own nut-free snack mix. If you're looking to avoid chemicals and such in your kids' snacks, Ian's snacks contain no artificial flavors, colors or preservatives. The best part? Ian's Fruit-a-Bits are made in a tree nut- and peanut-free facility. I'm always happy to find a nut-free snack or treat choice for my family and I love the fact that Ian's is organic. I hate giving my kids regular fruit snacks because they're loaded with chemicals and they stick to their teeth. Not so with these. The texture was much less "tooth-adhering." You can find these Ian's Natural Snacks at natural foods stores, Whole Foods and many supermarkets. Ian's has a store locator on their web site so chances are you can find their variety of foods near you. See what you think and let me know! Well, a lot of us suspected it, but it looks like the number of U.S. children with a food allergy is bigger than previously thought. A study that will come out in December in the journal Pediatrics reports that 4% of U.S. children have a food allergy. That adds up to about 3.2 million U.S. kids. Peanut and tree nut allergies are one of the top food allergies in children. Previous estimates stated that 1% of the U.S. population--in total--had a food allergy. Some food allergy opponents liked to quote this 1% as if it were proof that food allergies weren't very common and that people with them weren't very important--even though this added up to more than 12 million people. This number was also used to support arguments against peanut-free tables in schools, peanut-free airline flights and any other accommodations for people with this life-threatening allergy. The bottom line is that it looks like a lot of children have food allergies. The study showed how it cuts across ethnic, economic and racial lines--eradicating the other argument of food allergy naysayers--that allergies to food are the inventions of bored, rich white yuppie parents. Also, food allergies don't just affect young kids. I just got a note from a woman whose 14-year-old child was just diagnosed. Plus, I hear from adults with this allergy all the time. The important thing to remember is that the exact numbers are not the most significant point about this issue--it's more important to concentrate on the fact that many, many people are facing severe food allergies. And they don't just affect immediate family members--they also impact grandparents and other relatives, daycare workers, school teachers and other caregivers. So we should focus on figuring out why and putting a stop to it. I hope that this study is the first of many that exposes food allergies for what they are--a growing, serious and important health threat that needs further study, broadened treatment options and ultimately, a cure. 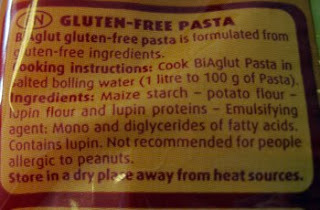 One of my blogger/writer buddies, Wendy, from the wonderful blog Celiacs in the House, sent me an alert about a gluten-free pasta that contains an ingredient called "lupin." Some of you may have heard of a product in gluten-free pasta brands that can cause an allergic reaction in people allergic to nuts--lupin is that ingredient. It contains proteins that are similar to the ones that cause an allergic reaction in people with nut allergies. So we definitely want to avoid it. Click here to read a previous post I wrote about lupin and gluten-free pasta. Wendy shared the above photo with me to illustrate that brands of gluten-free pasta, such as Bi-Aglut now has a peanut allergy advisory warning. Progress, definitely! In the past, no such warning was listed on the package. However, Wendy did tell me that another gluten-free pasta that she uses called "Schar" does not have a nut allergy advisory warning on the package, though it definitely should since it does contain lupin as an ingredient. The bottom line--if you're nut-allergic and also have allergies to wheat or celiac disease, be very careful of gluten-free pasta. If lupin is an ingredient, avoid it. And of course, ask your allergist for more details. This is a fairly new ingredient but with the influx of gluten-free foods on the market these days, it's something we should be aware of. Thank you, Wendy, for your consideration in letting us know about this. It's really important info! Anyone living gluten-free should check out Wendy's blog for terrific GF recipes, photos, info and much, much more. Also, a big thank you to all of you who commented on my previous post asking you about your top concerns as a nut allergy parent or caregiver! I will spend the next several weeks addressing them. And of course, keep your comments and questions coming, either by commenting on the blog or e-mailing me. As we approach the end of the year (and the second year of this blog) I am curious to know what nut allergy questions are still floating around out there. I know I've addressed many of them, but certainly not all of them.! And new questions will always arise. If you're new to nut allergies, what are your biggest concerns? And if you've been dealing with them for awhile, what are the areas that are most problematic for you? Likewise, what solutions are working for you? Or do you just feel overwhelmed by the whole thing? In order to serve you all better, please feel free to post or e-mail your questions or comments. I would love to feature some Q & A on my blog, so let 'er rip! Just wanted to give a shout out to one of my favorite companies, Enjoy Life Foods. They have a brand-new blog and I look forward to reading it. Enjoy Life Foods also has the added bonus of being available in many grocery stories nationwide, so not only are they a tasty allergen-free choice, but they are also a convenient one. Also, The Nut-Free Mom Blog appears on their blog roll. I just found out a few days ago and I'm honored to be in such great company--I see a couple of my blogger buddies there as well. I have a little story to share about Enjoy Life Foods that illustrates why I love it so much. A few weeks ago my youngest daughter was at her Daisy Scouts meeting and one of the leaders called me. She knew that I know about nut-free foods and was double-checking a snack they were about to serve the girls. One of the girls has a severe nut allergy, just like my oldest child. Well, it was unclear from the label if the food was nut-free and I hung up the phone unable to shed any light on it. I told my oldest daughter what had happened and she said "Don't we have some Enjoy Life Coco Loco Bars?" Yes, we did. In fact, I'd just bought them a day before. She then offered to bring them to the meeting so the allergic Girl Scout could have a safe snack that we KNEW without a shadow of a doubt was nut-free. My daughter took the short walk over to the school herself and hand-delivered the goods. She told me later that the girl with the nut allergy had her face light up when she saw a "safe" food arrive in a package with the words "nut-free" all over it. Plus, Coco Loco are darn tasty. Later, the Daisy Scout leader told me that she would keep the Coco Loco box for future meetings and that the girl's mother was ecstatic to learn that Enjoy Life Foods had saved the day. I think ELF got a few new fans that day. So for all of you who may not have heard of this fabulous allergen-free food company, be sure to check out their web site and look for them at your local grocery store. My daughter LOVES everything Nancy Drew. She is a fan of the books, from the vintage hardcovers that belonged to my Mom, to modern Nancy series available at bookstores today. She is also a huge fan of the games from Her Interactive. These award-winning games are a blast even for adults like me who love mysteries and still think Nancy is pretty cool. They always involve educational elements like history, science or social science and they've won a ton of awards. My daughter is such a fan of these games that I am usually suckered into being among the first to buy new ones when they emerge, every 3-4 months or so. The latest is called Warnings at Waverly Academy and it's all about "mean girls" and a not-so-nice prankster at a girls' boarding school. When she began the game recently, my daughter ran to tell me about about a character with a tree nut allergy who was put out of commission right off the bat by the school's mystery prankster known as "The Black Cat." The tree nut-allergic character speaks to Nancy's game character via cell phone (I know! It's so fun) and tells Nancy what happened with her accidental ingestion. According to my daughter, Her Interactive did a pretty good job of explaining that this allergic character needed to use an Epi Pen and that she needed to go to the hospital. My daughter was excited to find validation for her own situation via this tree nut-allergic character in one of her favorite games, even though (ugh) this person was basically poisoned. A couple of things bothered me, though. The allergic character told "Nancy" that she didn't use the Epi Pen till she got to the hospital (no, you'd use it immediately) and that she winds up in the hospital all the time because she's "not careful." Actually, the latter is actually not a bad reminder to be careful with allergies. The biggest worry I had was that, as nut allergies become more prominent, they are being used as a way to "off" people in both fiction and film--or at least the attempt is made to do so. I love Her Interactive and their wonderful series of games and I commend them for including a tree nut-allergic character in their latest venture. It does raise awareness, and the fact that the character is hospitalized underscores the seriousness of the allergy and the need to be cautious. I just wish that nut-allergic characters in literature, film or any form of fiction (like games) weren't always portrayed as victims or used as pawns by malicious characters. As a writer, maybe I'll meet that challenge myself. My kids have always loved famed chef and TV star Emeril Lagasse--maybe because he talks directly to the camera (as kids shows tend to do) or maybe because he made a Sesame Street cooking video several years ago--one of their favorite videos back in the preschool days. Either way, he helped get them interested in food and cooking which turned out to be a good thing once we discovered my oldest daughter's severe nut allergies. We cook and bake all the time around here now and the kids enjoy pitching in to help. So I was happy to discover this joint venture between Emeril and Enjoy Life Foods on YouTube. In it, Emeril visits a Whole Foods store and talks to families with all manner of food allergies and intolerance, including gluten intolerance and nut allergies. Then, he demonstrates how to make allergy-free brownies that can be enjoyed by families with multiple food issues. No matter what you think of Emeril, it's clear that the man loves food and is very enthusiastic about the subject so I think he's a great person to advocate for allergy-free food. His participation in this video also shows that food allergies have come a long way in reaching the public consciousness. First Martha Stewart posted allergy-free trick-or-treating tips on her web site and now Emeril tackles allergy-free cuisine! I'm encouraged when I see mainstream figures addressing the subject of allergy-free cooking and baking. It's just becoming an accepted thing--and as Martha would say, that's "a good thing." Granola bars are a great, quick and healthy snack--unless you have nut allergies. These bars are usually loaded with nuts or at the very least have come into contact with nuts during the manufacturing process. I always enjoyed granola bars as a snack and have wished my children could enjoy them as well. They are so easy to pack in a backpack or lunchbox. The good news is that there are more and more nut-free granola bars on the market these days. Two delicious versions that I've discovered are from Vermont Nut-Free Chocolate and Enjoy Life Foods. The only downside would be that these are a bit pricey. To help with the cost, click here to get an Enjoy Life Foods coupon. You can also find nut-free granola and similar nut-free snacks at FAB Snacks, founded by Jennifer B of the blog Food Allergy Buzz. Enjoy Life Foods are available at many supermarkets across the U.S. including Whole Foods Market. They are also now available at Jewel grocery stores in the Chicago area--that's where I buy mine. What are some reader favorites? I can't try them every granola bar out there, so let me know!